Last week I saw a nice article on building hardware keyloggers and today I saw a response on how to defeat them. 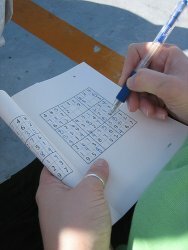 At least a few times a week I see someone playing Sudoku while commuting on the L, and it’s always annoyed me. The problem is that Sudoku is a small 9×9 grid with 10-20 numbers on it, and a book is a chunk of dead tree. How inefficient! There’s a tiny amount of very compressable data in a large, uncompressable phsyical object. I can’t do anything about the book, but I could imagine one with a grid on the back, a dry-erase marker in the spine, and two dozen puzzles per page in some kind of notation. I’m not going to start publishing specialty books, but I’d like to know what that notation will be.